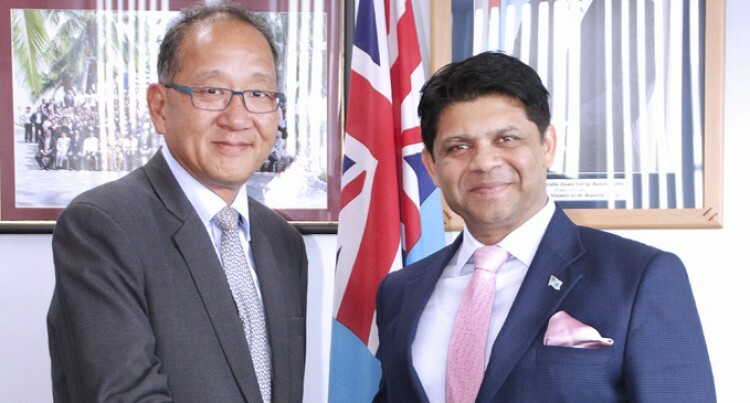 The Attorney-Gen­eral and Minister for Economy, Aiyaz Sayed-Khaiyum, met the United Nations Economic and Social Commission for Asia and the Pacific (UNESCAP) officer-in-charge Hongjoo Hahm to discuss areas in which Fiji could play a more ac­tive leadership role in the Pacific. Looking to a more resil­ient and sustainable fu­ture for Fiji and its Pacific neighbours, the two lead­ers spoke of the impor­tance of climate financing for the region. Praising the Fijian Gov­ernment for the issue of its widely-acclaimed sov­ereign green bonds, Mr Hahm stated the UNES­CAP would build on this success. This will be by explor­ing similar innovative fi­nancing instruments that could be developed for Fiji with a hope of creating a replicable model for other Pacific Island nations. Mr Hahm also com­mended Fiji’s rapid ITC evolution and the coun­try’s embrace of a digi­tal economy, saying that Government’s various technology initiatives and investments could serve as an example for others to follow. Mr Sayed-Khaiyum out­lined the country’s plan to continue this progress, in­cluding through the Fiji­an Government’s partner­ship with the Singaporean Government for Fiji’s Dig­ital Transformation. The meeting served as a preview for later this year, when a team from UNES­CAP will visit the country to further strengthen the organisation’s partner­ship with Fiji.